Stay tuned for upcoming events for SAF Charity Match in near future. 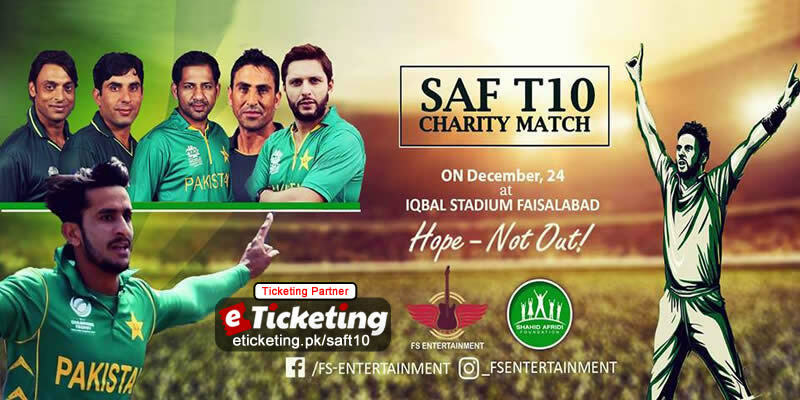 SAF T10 Match will be held on 24th December 2017 at Iqbal Stadium, Faisalabad. This event is being organized by Shahid Afridi Foundation in collaboration with FS Entertainment. Shahid Afridi will perform along with a host of cricketing stars in a Ten over Cricket match. A number of well-known celebrities will be there for a noble cause. Motto of the SAF Charity Match is "Cricket for Peace". Shahid Afridi Foundation arranges such events to raise funds for the well being, health and education of the underprivileged people. Slogan of the Shahid Afridi Foundation is "Hope Not Out". FS Entertainment is an event management organization. Its aim is to spread peace and love for all, through all kinds of fine arts. Terms & Conditions : FS Entertainment reserves the right of admission to the venue and event. Best Viewed at 1024 x 768 pixels and above. This Page loaded in 0.05049 seconds on Tue, Apr 23, 2019 (21:19).